What has led to this divorce crisis in the United States? Moreover, what can we do to strengthen our relationship and prevent the crisis from getting worse? The divorce rate in America is around 40-50% (and even higher for second marriages and beyond). It is no secret divorce has become commonplace. In the United States, we’ve been experiencing this divorce crisis since the 1970s. While the rate of divorce has largely leveled off, it still holds at a much higher rate than many other countries. Why is this? Is divorce really the answer? We were raised on Leave It to Beaver and other synthesized television and movies where people possess a deep yearning to be affirmed. One of the best ways to get affirmation is for someone else to commit their life to you. We may believe there’s a soulmate for us out there, someone who will change us and complete us. Look at any romantic comedy—Pretty Woman, for instance, where a prostitute meets Richard Gere and her life is transformed. What does the popularity of this myth say about our society? About women? But what happens after the tape stops rolling? Once the person is swept off their feet and walked into the sunset, how does it all play out? Movies and TV don’t show us real relationships, they show us mythology. They show us a group of uber attractive men and women, like in the TV show Friends, hanging out in a coffee shop, looking for the one. What happens when they find “the one”? The show ends and nobody shows reality. Years go by, jobs, kids, financial obligations. Suddenly, we may find the person we once held in high regard is no longer on the pedestal. We may feel irritated with the way they chew their food, the ways they don’t help around the house, the little jabs and comments made at our expense. All of this resentment and frustration builds, and we conclude that surely it means they weren’t “the one.” We must have chosen incorrectly, and our perfect person is still out there to discover. Maybe we even find our eye starting to wander towards other people. Could they be our “one”? The short answer is no. The idea that there is only one person out there we could be happy with is a myth. After all, with 7 billion people on the planet, finding that one person is a literal needle in a haystack. We would never find our perfect person, ever. Unfortunately, as romantic as we may initially imagine, the idea of “the one” is actually incredibly damaging to our relationships. We can, in fact, be happy with a wide number of different people. The truth of the matter is relationships require work, effort, and constant engagement. Relationships are partnerships. The other piece of the myth is the belief that it’s our partner’s job to make us happy and if we aren’t happy, they’re failing. Each of us is 100% responsible for our own happiness. While it’s common to feel intrigued, exhilarated, and excited at the beginning of a relationship, it’s not because our partner makes us happy. It’s because novelty gives us an endorphin rush. We feel good because we’re exploring a new, exciting person. We’re learning about them and we’re learning about ourselves as well. It’s the learning that’s giving us the high, not the other person. When someone new or interesting comes along, it’s again, a sense of novelty. We may find our head turns and our eye wanders, but ultimately, the other person won’t be capable of making us happy either. The answer to happiness is inside each of us. Years ago, Judith shared with me an article called the “Evolution of Man.” The article explained that when we start out, men believe women should be there to help them and meet their needs. As we grow in the relationship, we realize we need to communicate our needs and start to become aware of our partner’s needs as well. There are still expectations like, “Honey, will you do this for me?” but it’s conveyed rather than expected. Ultimately our goal as we evolve in our relationship is to reach the state of a true partnership. When we’re truly in a partnership, each person is putting forth effort. This doesn’t mean one person needs to do 50% of each chore. It means that on Thanksgiving, the men aren’t vegging out in front of the TV watching sports while women are in the kitchen doing the dishes. Maybe you run errands, clear the table, or shovel the walk. The point is, each partner appreciates the effort their spouse puts in. It’s noticed and acknowledged. Similarly, women don’t need to pretend to love sports, video games, or horror movies (unless they genuinely enjoy it). They don’t need to feign interest to coddle their partner. I’ve worked with couples who believe it’s wonderful they root for the same college team during March Madness. Yet, there’s no intimacy in their relationship. They’re not discussing raising their children. They’re not setting boundaries and expectations. They aren’t really connecting. Many people buy into the myth that what we share in common is what binds us together. A great relationship doesn’t come from shared interests whether it’s movies, sports, politics, or fine dining. It doesn’t matter what interests you share; it still doesn’t guarantee a connection. It’s also not about masculine or feminine interests. Our partnership comes from appreciation, engagement, and communication with our spouse. Learning how to communicate your needs, yearnings, and feelings is critical. This doesn’t mean great partners don’t fight. In fact, just the opposite! Great partners are deeply invested and care passionately about the relationship. They fight fair and engage in productive conflict. Strong partnerships are built over many years. They include ups and downs. It doesn’t mean your partner will never get under your skin. But when we let go of the fairytale myth of the “perfect relationship,” we can often see the ways our expectations cloud reality. Each person has what’s called a happiness set point, what researchers refer to as the hedonic treadmill. Studies show after a major event, positive or negative, people eventually return to their regular levels of happiness. In studies of lottery winners, after a few years, they reported they were only as happy as they were before their windfall. In the same study, those who experienced a major accident resulting in the loss of a limb also reported that, within a few years, they returned to their same levels of happiness as before the accident. Believe it or not, the same applies to relationships. While the beginning of a relationship may make us excited for a while, or we may believe ending a relationship will make us happier, the truth is happiness levels don’t usually change. If people divorced simply to become happier, the instance of divorce should go down with second marriages. The truth is, second marriages are even less likely to be successful and more likely to end in divorce. So why is that? If we’re unhappy, are we doomed to be miserable in our marriage and outside of our marriage? Yes, and no. The power to become happier is within each of us. It exists outside of our relationship and out of the control of our significant other. As the American divorce crisis grows, we’re seeing more and more people dissatisfied, but not realizing the dissatisfaction (and power to turn it around) exists from within. Now, in certain cases like abuse and infidelity, divorce may be the best choice. In other cases, like “irreconcilable differences,” where both parties are simply unhappy, there may be a path to find satisfaction and connection within the relationship rather than without. The first step starts by looking inside ourselves. What do we need to work on to bring us more happiness? This doesn’t necessarily need to include our partner. It’s about looking at what we can do to rekindle our sense of novelty and wonder. We get joy and happiness from new experiences and endeavors. Taking on challenges allows us to grow and experience new activities. As we grow, and our partner grows, we will start to feel more alive, engaged, and connected. For more ways you can grow and strengthen your relationships please visit the Wright Foundation. Join us for an upcoming More Life Training, where you’ll connect with other people on their transformative journey. Posted in Dr Bob WrightLeave a Comment on What is the Purpose of College: Prestige or Experience? Today, there’s a lack of dialogue and productive disagreement. Many people stick to the idea that we can’t find common ground on anything if we don’t agree on a topic. There’s no more agree to disagree consensus. What is driving all this disagreement? Is conflict necessarily bad? And if we disagree, how do we express it openly and honestly without burning a bridge? If you’re wondering how to agree to disagree (and still get along) with your friends and family, it’s important to get real with yourself first. Are You Adding to the Problem? We’re seeing a shift away from agreeing to disagree. The question is, can we disagree and still come to understand and respect each other? What people tend to do when there’s an argument and oppositional culture is to become uninterested in nuance culture. Either the other person is good or bad; right or wrong. Leon Festinger’s cognitive dissonance theory says we get stuck in an immature psychological development where we seek consistency among our beliefs on opinions. Whenever there’s a dissonance or inconsistency, we try to change our way of thinking back to this idea of black and white, right and wrong, good and bad. When we look at disagreements, many people can’t see any angle to reach consensus. We can’t accept there are kernels of truth within someone’s viewpoint, if it doesn’t align with our own. To touch on the political topic of the day, look at the people who attack the president. While there are a great number of controversial actions he’s taken, there are some good, intelligent actions he’s taken too (albeit not so eloquently). But for most people who disagree with him, they refuse to even admit any positives. The same goes for the other side, too. A student I was working with has a father who’s a big industrialist and he completely disagrees with anyone who has even a slightly liberal point-of-view. Instantly, those people are automatically discounted and dismissed. Unfortunately, we’re living in a time when the United States, and the world as a whole, needs to engage in dialogue. Conflict is productive and positive. It moves us toward what we want and helps us to reach a mutually satisfactory state. The problem is, we’re in a situation now where many people completely refuse to get there. Most issues aren’t simple. They’re nuanced and complex. There’s no simple black and white. The idea in any disagreement, political or otherwise, is there are always two sides. 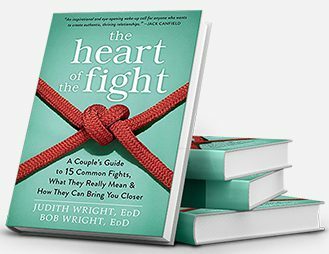 As we discuss in our book The Heart of the Fight, it takes two to tango when it comes to disagreements. In each conflict, we must learn how to battle responsibly. This means obeying what we call the rules of engagement, including the rule no one gets more than 50% of the blame and everyone is 100% responsible for their own emotions (including happiness). But what does this really mean? If your uncle brings up a topic you don’t agree with, you may know in your heart of hearts he’s wrong. In fact, you may disagree with everything he’s saying with every fiber in your body. Here’s the deal, though. People don’t fight with their friends and loved ones simply because they want to be right. You may end up right and still walk away with a destroyed relationship, leaving you empty-handed with a shallow victory. Instead, we should fight to find a common ground. Will you convince your uncle the world is round, the sky is blue, or whatever else he’s disagreeing with you on? No, probably not. Is it worth winning the argument to burn the bridge and destroy your relationship? In most cases, we would say no. Most of us want to preserve our relationships. This is often why it pisses us off so badly when someone we care about expresses a difference of opinion. We WANT to find a way to get along, but we also can’t set aside our own thinking of right and wrong long enough to find consensus. Of course, it also doesn’t mean we should lie about our position, concede, or acquiesce simply because we want to play the peacemaker. This isn’t an honest position and eventually our true feelings will bubble up and resurface. Instead, it’s important we fight honestly and fight fair. We take responsibility for our role in the conflict. If it’s a debate, we lay out the ground rules before we start discussing the topic. Maybe it’s announcing we probably won’t come to a consensus, but it’s important to us the other party listens to us respectfully and we plan to do the same for them. We’ll consider their evidence thoughtfully and respectfully. As soon as attacks get personal, we may want to put up the stop sign. We can let the other party know we plan to listen to them with respect and in turn, we expect they will listen to us with the same consideration. Then what do we do? We stick to our agreement. We may want to explain why this topic is so important to us, why it strikes a nerve; how we feel about the other person, including why we care about them and why it’s important to us we reach common ground. Today, there’s a tendency to remove debate and dialogue from our discussion. As soon as there’s a point of contention or conflict, people are ready to flip the table and storm out of the room. There’s nothing wrong with feeling angry or upset toward someone if you disagree with them on a topic, but it’s important we express our feelings honestly. Always come back to the larger vision of your relationship. Do you want your mother, father, or brother to agree with you on the current political climate because you want their support? Is it because you love and respect them and therefore want them to acknowledge your point of view and validate it? This may or may not happen. Unfortunately, in some cases, you may end up at a point where you simply agree to disagree and change the subject in order to preserve the relationship. As long as you’re honest and looking toward the larger vision of how you want your relationship to be, there’s no reason to beat a dead horse, especially if the other party shows no signs of coming around. If you’re ready to reach an agreement to let go of a topic, then it’s important both parties hold up their end of the agreement. When you say you’re going to agree to disagree, that means the little jabs and backbiting or passive-aggressive comments need to be checked at the door. Many people say, “well, we’ll just have to move on,” but then continue to dwell on the subject at hand. If you are confronted by this type of person, don’t be afraid to pipe up and remind them of the agreement. Usually when we lay out our feelings for the other person, it helps them regroup and check where they’re coming from. This type of honesty or “call out” is all we need to do to silence the passive-aggressive comments. Now, what are the chances they will stop completely? Probably not likely, but as long as you’re holding up your end of the bargain and truly sticking to your word, then agreeing to disagree is a perfectly healthy way to deal with unresolvable conflict on certain topics, but it must be done in a respectful manner. There has likely never been a time when dialogue has been more important. We see it in issues of race, economics, and especially politics. We need to actively engage on important topics like the environment, economic disparity, healthcare, and addressing issues of equality. Yet, we get so stuck in this state of expressing our opinions the conversation degrades and becomes a hot mess before we ever find productive ground. It’s important that we express our feelings openly and honestly in all interactions. Part of authenticity is being true to who we are and saying what we feel. When we try to hide our feelings or suppress anger, it will likely erupt at inopportune times and in other ways. Instead, speak honestly and tell the truth. Let the other party know how you feel. If you face a difference of opinion and reach an impasse (but want to preserve the relationship), agree to disagree and move on. Go into the conversation agreeing not to simply disagree, but to walk away with a greater understanding and respect for each other. For more ways to express your feelings, please visit the Wright Foundation. Join us for an upcoming More Life Training weekend, where you’ll learn how to live a life of more purpose, personal power, and meaning. Go forth and ignite your world with truth. Posted in Dr Bob Wright, People Like You, Personal Development, UncategorizedLeave a Comment on Can We Agree to Disagree and Still Get Along? …And why are they starving to death? The reason they’re starving to death is because they’re preprogrammed to miss – and don’t even see – the food at the banquet. Many people are stuck living out a self-fulfilling prophecy where they only reach for the limits of what they can see. So how can we break out of this cycle of falling into the self-fulfilling prophecy trap and take back our personal power? We have to start seeing the whole picture. Another way to think about self-fulfilling prophecy is to compare it to a new, modern grocery store. Now, when I was a kid, we had a corner market. You’d ride your bike there and pick out some candy. The selection was limited to the major brands. Often if you wanted, say, dish soap, you’d be stuck choosing between Lux and Dreft—two options, if you were lucky! Now, look at the modern grocery stores! We can get fresh cut flowers, ready-made dinners, pre-made foods. We can choose from hundreds of different brands and options for nearly every product. If we want organic fruits and vegetables, there are entire sections. You can get sushi, jicama, kombucha, and dragon fruit…you name it and you can find it at almost any market! Modern stores pre-package food and create delicious bakery items to tempt us by the checkout. If most of us were left to our own devices, we’d stick to the list, but grocery stores are built on encouraging the impulse buy. They’re designed to spur us to crave purchases we didn’t even realize we were looking for. The seat of our consciousness is our frontal lobe. It doesn’t have much bandwidth to recombine new variables. When we enter the grocery store, we scan the aisle looking for items we recognize. We aren’t looking for all these new and amazing treats, because we don’t even know they exist yet! The same is true for any meeting we’re taking part in. It applies to any relationship and interaction we have. This same truth applies to anywhere we go and any experience we have. We look for sameness, the items we recognize, and the familiar. But we have to ask ourselves why. Why does this limited perception happen? He identified two types of apperceptions: empowering and limiting. Coming back to our banquet or trip to the grocery store, this gives us a way to think about our neurology. We’re not choosing new experiences because we don’t realize they’re available to us. We have limiting beliefs, which define the limits to which we can use our positive beliefs and positive skills. These beliefs determine the actions we take. When we base our actions on these limiting beliefs, the world confirms exactly the way we act. We get stuck in a cycle of self-fulfilling prophecy, where we act in such a way that the world constantly reinforces our beliefs, even if they aren’t correct or true. For example, if I believe I’m not good enough, then I will carry myself as such. People around me will view my timidity and self-doubt as confirmation I’m not up for the task. As they treat me like I’m not good enough, it reinforces my limiting belief…and the self-fulfilling prophecy cycle goes around and around. If we’re lucky and our bosses, friends, and partners don’t buy into our limiting belief—if they see beyond the vibe we’re putting out and challenge us instead of accepting it—then our limiting belief gets put to the test. Through the challenge, we discover we ARE good enough. The tide starts to turn on our limiting belief and self-fulfilling prophecy; we start to internalize and believe we are actually worthy of the life we want. The good news is, we don’t need to wait for our boss, our friends, or our lover to change our limiting beliefs and stop the self-fulfilling prophecy. We can start to work on them ourselves, right away. One of the first ways to fight limiting beliefs on your own is by assessing your good ol’ internal monologue. What are some of those statements you say to yourself (that you don’t always say aloud)? I knew I couldn’t do it. I knew this wasn’t going to work out. I always screw this up. If we want to fight those self-fulfilling prophecies, we should start looking for the evidence to contradict those limiting beliefs. How can we find contrary proof that those beliefs are wrong? How can we identify all the times when a situation goes better than expected, where we do a great job, or where we find a fantastic learning opportunity amidst the challenge? We can start to prophesy the positive rather than predicting and expecting the negative. When we do that, our prophecies still come true, but they’re propelling us forward instead of back. One of the ways to reinforce our new beliefs about ourselves is to start hanging out with and surrounding ourselves with those who see us differently; those who challenge us because they believe differently about us. Rather than sticking with the same interactions and patterns that no longer serve us, start seeking out those who push you toward your best self. Don’t believe those new views on your potential? That’s okay. You can literally fake it ‘till you make it. Start reframing the situation and looking for proof to reinforce those new thoughts and beliefs. Start looking at the endcaps of the grocery store. Check out what they have in the deli. Don’t just go in and grab your TV dinner and leave—see if there are better, more nourishing options out there. Even when we “fake it” or take a different path, we’re influencing the world around us. Like a mirror, the way the world sees us will be reflected at us and will reinforce our new perception. Guess what—when you feel self-doubt, you’re in good company. In fact, there is absolutely no one in this world who doesn’t have limiting beliefs. Even the most confident, self-assured, and poised person you can think of still have limiting beliefs. Those people who claim they don’t, or even believe they don’t (because they believe they’re “superior”), actually have an inferiority complex at their core. Admitting your vulnerabilities and insecurities is the first step to stopping your self-fulfilling prophecy cycle. If we want to change our limiting beliefs about ourselves, we must realize we’re each the creator of our own life. We can choose from infinite possibilities. We may keep going into the same grocery store, buying the same list of familiar items, but we’re missing out on the banquet before us. We could read all the self-help books in the world and take self-improvement classes, but they won’t change us unless we learn how to be truly vigilant in the way we talk to ourselves. Do you look for opportunities to acknowledge your success? Do you stretch yourself to grow? Do you learn from mistakes and look forward to the insights accompanying them? These aren’t easy actions to take. We may feel defensive or disheartened at the prospect of taking these on at first. It’s important to remember, those who are constantly defending themselves are often caught up in their self-fulfilling prophecy. They aren’t allowing themselves the opportunity to learn and grow from experiences. As you listen to your self-talk and affirm yourself, seek evidence your new beliefs are true. Surround yourself with people who push you to explore your boundaries and challenge these beliefs. Friends become allies when they help us break out of our loops and become aware of the self-fulfilling prophecy trap we may be stuck in. One of the great benefits of our personal development programs at the Wright Foundation is our students are surrounded by others who are also seeking to break out of their own self-fulfilling prophecy cycle. These people aren’t committed to accepting your limitations. They’re ready to help each other break out of boxes because they’re committed to breaking their own limitations as well. It’s like training for the Olympics—you surround yourself with coaches and other athletes because they’ll push you harder. They’ll expect as much from you as they expect from themselves. This kind of support is necessary if you want to live an Olympic-sized life. So, if you’re ready to break out of your cycle of self-fulfilling prophecies, take a hard look at your self-talk and limiting beliefs. When you walk into the banquet or peruse the aisles at the grocery store, are you trying all the new and exciting possibilities before you? Visit the Wright Foundation for more ways to grow and learn. Join us for an upcoming networking event, where you’ll connect with new friends and allies who can help support you on your journey. Go forth and ignite your world. Posted in Dr Bob Wright, Personal DevelopmentLeave a Comment on Are You Living Out a Self-Fulfilling Prophecy? Posted in Career Advice, Dr Bob Wright, Personal DevelopmentTagged authenticity, better career, better relationships, building relationships, career advancement, career advice, Dr. Bob Wright, engaging, leadership, personal developmentLeave a Comment on What Does it Mean to Be Authentic? Three Ways to Make This New Year Great! In January our thoughts turn to new beginnings, resolutions and a chance to make this new year great. While many of us enter with the mindset of making it our best year ever, the question really becomes how? How do you plan to make this new year great? What are the steps you will take as you move toward becoming your next, most radiant self? Here are three ways to make this your best year yet. I remember a few years back, it was January 1st and I was really struggling to start the new year out right with a positive, can-do attitude. The previous year had been a challenging one for us financially and it was hanging over my head like a cloud. Additionally, I was looking at an amazing list of initiatives, goals, and opportunities to tackle in the year ahead. As I tried to prioritize, each one seemed like the most important until the ‘next most important one’ came into view. Talk about how to eat an elephant! As the story goes, it’s easy to say, “Just eat it one bite at a time,” but it is quite another thing when that immense carcass is looming. Focusing on each bite and taking responsibility to preserve the rest, so it’s still fresh for later is a real challenge—how do you avoid missing opportunity? These thoughts were how I started my day, overwhelmed, challenged, and despairing, haunted by these thoughts and disturbing dreams from the night before. While eating breakfast, I had finished reading the paper. I began reviewing our book Transformed! to prepare myself for media and the book launch. We had quite a bit lined up and I remember I was going on Coast to Coast, a nationally syndicated late night radio show for three hours on January 10 and 11, that year. As I reviewed the book, I read the section on recognizing our deeper yearnings. Talk about being bowled over! Right there in black and white, we had written the answer to my struggle. I was forgetting to walk the walk! We said in the book that the key to setting ourselves up for successful change was to list goals. Then we should ask ourselves why we want that goal and what we hope it will do for us. We begin by communicating to ourselves, “I want this goal so that ________.” Our book directs us to keep digging until we find the deeper yearning beneath the goal. It was the answer I was looking for. I told my wife Judith about the irony of how much I needed these words right then. I told her how I needed to practice what we preach by focusing on my immediate yearnings. As she often wisely does, Judith asked me a few revealing questions and I clearly was fearing pain and problems in the future and failing to choose full aliveness in the moment. Judith helped me further clear some stinking thinking that was going on in my head. I recognized my desire for greater financial solidity and student flow was stemming from my yearning for more fulfilling contact and joy. I was missing that contact and joy in the moment right then. But once I recognized the underlying yearnings—the deeper desires beneath my wants–I became unstuck. The takeaway lesson is if you want to make this new year great, remember that beneath every surface want is a deeper yearning. When we distill our wants down to discover the underlying yearning, our path becomes clear and focused. We can re-orient ourselves toward what we really yearn for. Aliveness is the foundational principle from which play, truth, joy, love, and everything stems. When we repress ourselves, we are cutting down our aliveness. Aliveness is that bubbly force that explodes from us when we laugh, when we giggle, when we cry, when we yell. These all are part of the expressive pole of aliveness. There is also the aliveness of contained joy and excitement where our senses are heightened, and our vision becomes clearer, more focused. Our attention is fixed and the bubbling builds anticipation and excitement, a fountain of possibility and potential. Aliveness may come in the form of our anticipation of a lover, a child awaiting the return of his father after a day’s absence, a student anticipating the results of a test. Every moment of our lives is pregnant with possibilities. Too often, our moments are also filled with loss aversion—the immobilizing fear of failure that puts us on automatic pilot. Often this fear is barely perceptible, but it holds us back from fulfilling our yearnings. Aliveness is the principle that unleashes our deeper yearnings and causes us to be more in touch with our emotions in the here and now. Aliveness brings our hunger to the surface—our hunger for experience, our hunger for contact, our hunger to see and be seen, our hunger to make a difference, our hunger for something new. Aliveness brings out our hunger for adventure, for meaning, fulfillment, and satisfaction. These do not come without a cost, because by engaging we will inevitably be more hurt as we open ourselves up to new possibilities and uncertainties. But by being more hurt, we have an opportunity to learn and grow. Go for it! As you reflect on the past year and look forward to the upcoming year, you may notice times when you went through the motions but weren’t really “living” life. As you look toward ways to make this new year great, commit to seeking new experiences, new adventures, and new opportunities. Approach the world with a childlike curiosity and wonder. If we really want to be fully engaged and alive this year, we also have to focus on our personal growth and evolution. Many of you may have been burned in the past by seminars, classes, books, and more, all promising a fresh start. What happens after a month or two? We think, “well, that was nice,” and then we slide back into old habits and patterns. Growth isn’t a one-time goal. To transform and truly become who we want to be, we need to wake up each day to a new assignment and a new task. We have to stretch and push ourselves toward continued growth and mindfulness. Each day and in every situation, we can extract the lesson and the learning opportunity (especially from mistakes). We call this the assignment way of living. So, here is what you really wish for: an extended community of like-minded individuals across the country, supporting each other and working on a common assignment to bring out the best in themselves and those they touch. These individuals connect with each other and become allies as they share in their learning and growing. They inspire and encourage each other on their path. At the Wright Foundation, this is exactly what we offer in our classes. It’s our goal to bring people together, to help them connect and to live their best life. Each person who participates in our program receives regular assignments—a new focus and lesson each week, month, or quarter. These assignments are based on a principle, concept, or lesson to focus on personal development in concert with others. Just imagine being surrounded by a community working on the same assignment designed to encourage and inspire more effective relationships, bring more meaning and satisfaction to every moment, and provide more service—maximizing potential for love, enjoyment, and leadership! This is what our students and community have requested and what we strive for in the Wright community—an accessible way for you to keep challenging yourself and to keep you connected with individuals doing the same. Whether it means following along with our blog posts, reading books, downloading courses from our website, attending one of our many free networking events, or participating in our classes and programs, we’re here to help you on your journey. Commit to learning and growing this year! This month, kick off the new year with a January assignment and goal to live the principle of ALIVENESS every day, as fully as possible. What does it mean to live the principle of aliveness? It means to be more deeply engaged with others. It means to be aware and mindful as we journey forth each day. That means that you orient to the principle of aliveness in the morning when you wake up and envision yourself being more alive at different points during the day. One of the check-ins we use is the implementation intention of If…then’s…. For example: If I am at a business meeting, then I will speak up at least three times. Or if I’m faced with a situation where I disagree with someone else, then I will ________. If my partner gives me grief, then I will_______. Each moment, we should plan for ways we’ll move toward becoming more alive, more honest, and more fulfilled by our interactions. If you want to make this new year great, start by orienting toward aliveness. Throughout your days, ask yourself the question, “How can I be more alive right now, in this moment in this situation?” The road to greater aliveness leads through expressing rather than holding back the thoughts we have when we edit our judgments, fears, or other feelings. At the end of your day, reflect—how did you orient toward aliveness today? How did you express your thoughts and feelings? What did you learn today? You can make this new year great! Wishing you all the joy of the season. This year commit to a life full of realized yearnings and greater fulfillment. To join us for an upcoming event, please visit the Wright Foundation website. Join us for an upcoming networking event where you will connect with others and learn more about yourself. We also want to announce the availability of many of our courses for download. Don’t miss out on the special introductory price for many of our courses and lectures. Posted in Dr Bob Wright, Personal DevelopmentTagged aliveness, authenticity, better relationships, Dr. Bob Wright, engaging, happiness, personal developmentLeave a Comment on Three Ways to Make This New Year Great! Awake or asleep? How do you want to navigate the holidays? Whether you’re going to a family gathering, work get-together, or social function, the holidays are a busy time…and sometimes the busyness translates into stress. The stress is compounded by unfinished business lurking in the dynamics of our family circles. This constant hustle and bustle zaps our energy and leaves us feeling less-than-joyful. We forget what the holidays are all about. In fact, many of us may wish for them to just be over with. But the holidays are a wonderful time to catch up with friends and family. It’s an opportunity to fill our lives with joyful experiences and stronger connections; all we need is a shift in our approach. So, this year, rather than reaching for the eggnog to zone out, here’s how to engage with others, zone in, and bring more meaning into your holiday season. If you want to have happier holidays this year, the choice is up to you. When I was very young, my sister and I were sitting at the kids’ table one Christmas. I believe my sister was about five-years-old at the time. Like many children, she didn’t operate with a filter yet. Typically, she said whatever was on her mind. Now, what happened? All the adults erupted in a nervous, uncomfortable laughter. Someone shushed my sister. But the truth was, while her comment was probably a little insulting to the dog’s owners (who were lovely family friends), it was coming from a place of pure honesty. She simply articulated what the rest of us were thinking. The adults might have had sympathy on the surface, but they still gossiped and rolled their eyes about a dog at the dinner table. So which reaction was really any better? How many of us go into social situations, afraid to pipe up when there’s a dog at the table? We hold back, afraid to say what we’re really thinking. We don’t express what we want and we shy away from conflict. This means we end up making excuses for avoiding the in-laws. When we do end up at a party, we might feel stressed, annoyed, angry, and resentful. We may feel upset with our spouse for dragging us to a function we didn’t want to attend. When we experience these resentments and frustrations, it leaves us feeling drained, tired, and less-than alive. We drink another glass of champagne. We watch TV. We wait for it to be over. And these feelings aren’t limited to holiday functions. This holiday season, choose aliveness. A lot of people are going to drink their way through the holidays. It’s not because they’re happy. It’s because they don’t know how to deal with it. Even those who don’t imbibe still turn to screen time and other soft addictions to help them cope. We turn on the football game, we blast the parades, we pack in distractions because we simply don’t know how to be fully alive and present with others—particularly our families. If we’re alive and present, we’re going to follow our yearnings. If we follow our yearnings, we’re going to speak up like my sister did to our dog-owning friends. We assume it’s better instead to “keep the peace” but it doesn’t truly bring us peace internally. We all have family members who button-hole people at the holiday dinners. The uncle who drones on and monopolizes the conversation to all who will listen. Aunt Suzi prattles on and on. She catches peoples’ ear and talks endlessly about topics no one else cares about, while the audience member scans for an exit. We know a simple question leads to tragic entrapment. So instead we avoid. If we end up in the next room, we find Mom and Aunt Ann gossiping and complaining about the men. Then we run to the next room with the kids who are whining about the adults. We’re simply wandering through, looking for a way out. As the game matures, everyone learns to put on a stiff upper lip, a social look, and save their judgements for the car. Once they get into the car they unload. What happens? A fight erupts. This was always the case with my family. A two-hour odyssey “over the river and through the woods” (or in this case through Chicago and past O’Hare) to get to the family was filled with tense anticipation. My father wasn’t looking forward to seeing my grandmother, who had a high-pitched voice like nails on a chalkboard. The whole way to visit family for the holidays the fight would get going. Not because my mother didn’t agree, but because she was very enmeshed with my grandmother. They spoke so often, in fact, my father bought my mother a shoulder cradle for the phone (back in the days of “landlines”) so she could do dishes and housework while my grandmother prattled on and on—otherwise, she may not have ever gotten anything done. Meanwhile, my grandfather didn’t like my father because he’d “stolen” his baby girl and was less affluent than they felt she deserved. It took years for my grandmother to realize my mother had actually made a wise move to marry for love. So, there we were with all this unfinished business driving on the highway; my father upset and irritable; my mother downplaying her own irritation with my grandparents, even though she knew as well as we all did, it wasn’t a pleasant situation. But on we went, and it was miserable every year. Now, were we all wiser back then, we would have realized the unspoken feelings and resentments that were building up weren’t letting us feel the joy of Christmas. We weren’t engaging. We weren’t connecting. In fact, there was nothing about the spirit of the season to be found. The truth is, being honest is the key to bringing about happier holidays. Now, this doesn’t always mean a brutally honest verbal knockdown and drag out around the yule log. When we go into a situation with our emotional guns ablaze, we rarely resolve anything. But embracing honesty throughout the year will help you have happier holidays. Even if it seems too late to start this year, it’s not. Express your feelings to your spouse about the situation BEFORE you get in the car and head to the events. Agree to a time limit or come up with a codeword when Aunt Suzi corners one of you and starts chatting. Use the time to connect more deeply with your partner and have a little fun with the situation. See yourselves as allies, who are in the situation together. Beyond the holidays, commit to more honesty and greater aliveness in the new year. This means honestly acknowledging and appreciating the positive aspects of your life, your family, and your relationships. It also means honestly expressing your feelings and engaging in productive conflict as you work FOR the better of the relationship. It may help to remember, one of the Rules of Engagement from our book, The Heart of the Fight is to fight FOR rather than against. Another key rule is to assume good intentions on the part of the other party. When your father-in-law starts proselytizing about politics or your sister offers up thinly-veiled critiques of your job, operate with honesty but engage with them as a chance to learn. Can you empathize with their point? Can you ask them to help you understand where they’re coming from? How can you learn more about who they are? View it as a chance to learn something new about yourself. When the dust settles, another key to happier holidays is to really use them as an opportunity to reflect on and appreciate what was good over the past 12 months. Create a ritual where you reflect on the transformative experiences you had this year, including holiday time with family. What did you learn about yourself? What did you learn about your loved ones? Use these insights from your reflection to plan with more intention in the next year. How will you bring more aliveness to your life? What will you carry with you into the future? What will you leave behind as you let go of the past year to help you move forward? This time of year is a powerful opportunity for visioning and setting your intention and dreams for the year ahead. The same is true for all of us (including your family). If you’re looking for an opportunity to experience happier holidays and engage with your family during events, use these dreams as a platform for conversation. It’s extremely interesting to discuss with family members their dreams for the next year. Find people in your family who are doing something and talk to them about their dreams and goals. Support them in following their dreams. Support them in stepping out on their own. You may not have the nerve to step out on your own in the past, but you may encourage a younger family member to have the courage to live their dreams. You can be fully alive and in the spirit of gratitude for the holidays without being “polite” or lying to those around you. In fact, embracing honesty is key to having happier holidays. Use the challenging situations to discover and learn more about your relationships, your family and yourself. Give purpose and meaning to the holidays and give purpose and meaning to how you want to develop yourself. You might not dive into all of the chaos of the family dynamic or resolve all your issues in one visit but operate with honest and openness as you mix and mingle this holiday. For more on how to live with more honesty and intention, visit the Wright Foundation website. Join us for an upcoming networking event where you will connect with others and learn more about yourself. We also want to announce the availability of many of our courses for download. Don’t miss out on the special introductory price for many of our courses and lectures. One of the most amusing statements I hear people say is how different they are when they’re at work than when they’re at home. The truth is, we’re the same everywhere. Chances are if you’re bothered by certain types of people, or if you fall into the drama triangle at work, you’ve probably seen the same patterns at home. Like it or not, pleasing your boss and getting along with your coworkers often mirrors the dynamics you experience with your family. In fact, we spend much of our time at work. So, it’s natural we would build strong relationships. After years at work, many people find they’ve recreated their family relationships and dynamics at the office. That hard-to-please mother? She’s your boss. Your easy-going relationship with your dad? You might see the same dynamic at play with your favorite manager. That coworker who pisses you off? He has the same traits as your brother (and probably gets under your skin for the same reasons). We automatically recreate our expectations of the world and our relationships right there in our office from 9-5. So, if you want to start getting along with your coworkers, it’s important to remember—the dynamics are all relative! Within most workplaces, there is a hierarchy of authority. Well, guess what—growing up we also experienced a hierarchy of authority. For most of us, the authority came from our parents, but no matter how your family was structured, there was a power dynamic at play. In most households, Mom and Dad were the first authority figures in your life. Your relationship with them is reflected in your relationship with and feelings toward authority figures throughout your life (whether you like it or not). Let’s say you had authoritarian parents who were very demanding. Mom and Dad only wanted what they wanted, and they didn’t care what you wanted, or you didn’t get a say in what you wanted. Well, you probably learned to resist them. Possibly, you learned to passive-aggressively resist them by not really doing exactly what they wanted. Or you learned to openly get mad and fight them and resist them. Welcome to your authority issues today. If you were competitive or in conflict with your parents, you’re probably going to struggle at the office when you feel bossed around (which is, as we all know, a natural part of work). If your parents were inconsistent and the hierarchy and the power balance between you was hard to figure out, you’ll often see this same scenario play out again as authority issues at work. You may face a tough time figuring out your boss. You may feel the need to question your manager or balk at orders and instructions. Or you may put on an air of agreeability but bemoan the orders the moment your manager is out the door. All these reactions speak volumes about the way you view authority today, as well as the authority you were raised with when you were growing up. Eventually, you’ll face similar feelings in the workplace to those you experienced in your childhood and felt toward your parents. It’s a natural, normal part of human behavior. A lot of people realize they have authority issues, but identify the problem as, “my boss is a jerk.” When we pin the problem entirely on the personality of our boss, we fail to recognize these issues stem from and exist within us. Don’t like your situation at work? You have the power to explore and change your relationship with authority. You were born in your family issues—long before you had any say in the matter. But recognizing this truth will help empower you. Even if your boss or coworkers are vastly different from your parents, you will eventually create and experience the same patterns over and over again that you played out during your childhood, so it’s important to explore these dynamics and their origin. What happens to those who grew up in super enmeshed families? We see people who grow into middle age without ever really becoming adults. They never truly disconnect from their parents and learn to function as whole, adult human beings. This plays out in relationships at work and even within romantic relationships. This over-parenting leads to a lack of independence, confidence, and ability to make decisions. So, what does this mean for you? Do you want to break free from the patterns? Do you believe they don’t affect you? Well, first of all, tough luck. You take your family everywhere. It’s impossible to avoid recreating the dynamics because it’s an integral part of your programming. You will find your parents’ traits in others throughout your life. If you can’t find the traits of your parents right away within the people you meet, then you’ll recreate those relationship dynamics as your connection develops. No matter what your relationship with your parents was like (and there are no perfect parents out there, so if you think your parents were “saints” think again), you will see this play out in your relationships later. We call this your unfinished business. The realization we’re carrying around our familial issues is tough to take. In fact, most of us don’t love the idea. It may even make us feel angry. The good news in all of this is your work relationships create a great opportunity to explore your unfinished business and apply personal growth lessons in the real world. If we’re interested in learning, growing, and becoming more complete human beings, then our work relationships provide us with an excellent chance to really explore our dynamics with others. At work, you have a perfect laboratory of sorts to look at how your relationships play out; to think about how getting along with your coworkers or not getting along with coworkers mirrors your connections with your family members. In an ideal setting, you are the authority in your own life. You embrace the power within you and consequentially, you fully acknowledge the authority of those over you, such as in a work setting, without resentment. In fact, in an ideal situation you, empower those authorities without undue competitiveness or anger. But of course, most of us still have growing to do. We have unfinished business to address! I had a fantastic experience working with a group of executives recently. These execs reported to a few CEOs who they described as erratic egomaniacs. Since they reported to the jerk bosses, they were able to justify all kinds of rebellious, underhanded behavior. Working for challenging bosses gave them carte blanche to “match” the behavior with equally deceptive and nefarious actions. To understand the dynamics at play with their bosses, these execs had to roll up their sleeves and start to explore their own unfinished business. To figure out how to become better leaders, they had to examine their upbringing and their relationships with their parents. Another executive I had, grew up with a father who was a nice guy, but largely distant. His mother was erratic and enmeshed. He was reporting to the CEO of an international company who was an egomaniacal fool. At an event with 10,000 people, the CEO took the opportunity to humiliate him. This particular executive had never confronted his mother for her behavior, and he was struggling with how to cope with addressing the embarrassment from his boss. The moment when it all clicked for him was when he was able to confront his mother about the unfinished business he was carrying around with him. As he begrudgingly examined the issues with his mother, he realized his CEO had filled that role and taken on the same dynamic. He had projected his business onto his boss. Once this was addressed, he was able to reshape the dynamic with his boss and eventually became his righthand man. He realized he’d gone from the verge of getting fired to a position of confidence and trust. Within his role, he was able to temper his boss’s reactions and advise him as well. The miracle at hand wasn’t due to a change of heart from his boss, but a change of heart within himself. He confronted his unfinished business. Like these executives, we all face a challenge to become whole and complete human beings. It’s incumbent on each of us to address our unfinished business, so we become more honest and straightforward communicators. It’s not about simply “tolerating” or getting along with your coworkers, but rather digging in and understanding why you click (or why you don’t click). One of the best steps we can take to improve and understand our work life is to understand that our dynamics at work are relative—a direct reflection of our family of origin. Work gives us a great sandbox to experiment with these dynamics and explore our connections. So, look around at the people you like a lot at work. Who do those people remind you of in your family? Then take a look at the people who get under your skin. Who do they remind you of? Push yourself to explore the lesson at hand. What immaturity and unfinished business are you bringing to the office? For more on building your relationships and power at work, visit the Wright Foundation website. Join us for an upcoming networking event where you will connect with others and learn more about yourself. We also want to announce the availability of many of our courses for download. Don’t miss out on the special introductory price for many of our courses and lectures.